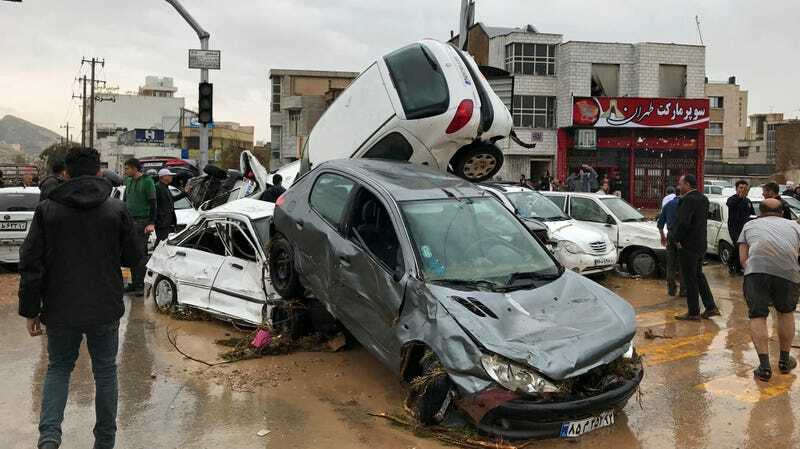 Floodwaters completely wrecked these vehicles Monday, March 26, 2019, in Shiraz, Iran. The grim news of fatal floods doesn’t end. In Iran, where people have been celebrating the start of their new year called Nowruz, flash floods have killed at least 24 people and injured over a hundred, according to the New York Times. According to local news, at least 19 died in the city of Shiraz alone. President Hassan Rouhani issued a nationwide alert to all governors Sunday as widespread flooding was revving up. Due to the holiday, many families had been traveling when the flooding began, a result of heavy rain showers. Northern provinces were especially hard hit initially, but the flooding is spreading, per local reports. As AccuWeather highlighted, the floodwaters were so strong in some areas, they were moving entire cars down highways-turned-rivers. An estimated 200 vehicles were swept away in Shiraz, per local news reports. Intense video footage circulating on social media shows people getting swept away, too. WARNING: Some may find this footage disturbing. “Protecting people’s life is the main priority, and the people of Iran should know that all authorities and the armed forces, as well as relief agencies are working round the clock,” said President Rouhani in a meeting Tuesday with his disaster management force, per a press release. Military rescue boats search for survivors in Aq Qala, Iran. The rain began in the northern provinces like Gorgan and Babolsar on March 17, with more than 7 inches dropping in 24 hours, according to FloodList, which tracks such events. On March 24 and 25th, another bout of heavy rainfall hit further southwest, causing the catastrophic flooding in Shiraz. Thousands are displaced and tens of thousands have been affected by the recent floodwaters, according to FloodList. The situation is so awful that the United Nations has offered its services to government rescue and relief efforts. Iran has been no stranger to serious floods in recent times: the region saw bad floods in January that led to the evacuation of some 800 people, as well as in October when nine people died as a result. While Energy Minister Reza Ardekanian is pointing his finger at climate change, according to France 24, the Iranian Human Rights Monitor is looking at deforestation as a cause. 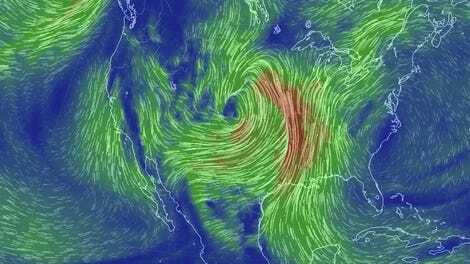 It’s possible both factors are at play: Climate change models have projected the country to receive increased rainfall under a warmer world, leading to increased flood risk. And without tree roots to absorb the rain, it becomes runoff, swelling rivers and infiltrating nearby communities. Southeastern Africa is still reeling from the deadly fallout of a rare cyclone that hit the coast of Mozambique more than a week ago. Now, it’s Iran. Until floodwaters begin to recede, authorities can only estimate how bad the damage is.